Sailing has been in the blood of prestigious Swiss watchmaker Edox for more than 50 years. And since 2008, the Edox Grand Ocean collection of distinctive marine-themed timepieces has wowed watch and water sports fans alike. Now Edox has embarked on a fresh maritime adventure, becoming Official Timekeeper of an exciting new competition, the Extreme Sailing Series, to be sailed at eight venues across three continents in 2013. The racing features some of the world’s best skippers in thrilling close-to-shore duels in high-tech multi-hull craft. 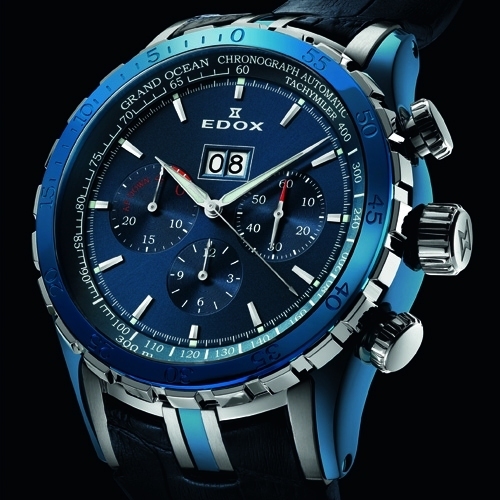 The Grand Ocean Extreme Sailing Series Special Edition is a unique watch celebrating this partnership, with Edox providing an essential element for sailboat racing - precision timing. The 48mm Special Edition is a striking example of Edox’s craftsmanship, a legacy that dates back more than 130 years. Housed in a stainless steel, black PVD case, the Special Edition is big, bold and beautiful, displaying hours, minutes, seconds, an easy-to-read big date and chronograph, all seamlessly powered by an automatic Edox calibre 45 “engine”. Hand-assembled at the Edox base in Les Genevez, the Special Edition is water-resistant to 30 ATM (300 metres or 900 feet) and features a “toothed” black and silver rotating diver’s bezel and black rubber water-resistant strap. A sub-dial at 9 o’clock is a vital tool for sailors; a display that counts down the four minutes to race time, while luminous hands and indices mean vital readings be easily seen in low-light conditions. The Special Edition’s rugged multiple-piece case construction gives it an edge in quality unmatched by competitors’ products in a similar price bracket. A specially designed engraving on the caseback, commemorating the Extreme Sailing Series, cements the Special Edition’s unique place in the Edox Grand Ocean family - already a leader on land as well as water. Jura-based watchmaker Edox has been producing fine, precision timepieces since 1884 and is the Official Timekeeper for the Extreme Sailing Series, Dakar Rally and Class-1 World Powerboat Championships.